It is our pleasure to welcome you to Gulfside Periodontics, the office of Dr. Thomas B. Carter, Ocean Springs’ only board-certified periodontist. 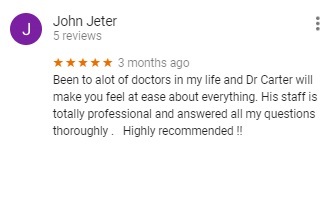 Here you will find not just Dr. Carter, but also, his staff of caring and enthusiastic periodontal associates. From the outset, all members of the practice have united in the belief that each of our clients is a unique individual and as such has oral health needs unlike anyone else’s. We believe that a unique person deserves an individualized dental or periodontal treatment and care plan. Oral health requirements are no more “one size fits all” than any other type of health care need. We are a team of talented and dedicated professionals, all of whom are committed to providing the best possible patient experience in the areas of periodontics, dental implants, and oral medicine. We are united in our desire to help you reach your goals of achieving and maintaining excellent oral health. You’ll find that our practice uses the most up-to-date protocols currently available in the field of periodontal medicine. We value education, yours as well as our own, and seek to stay abreast of current developments in periodontology and to share new knowledge and techniques with the community. We view each of our clients as the unique individuals they are, and as fellow members of the Ocean Springs community, and as our friends and neighbors. Therefore, it is our mission is to provide these individuals with the highest quality periodontal care possible. Furthermore, we wish to do so in a relaxing, comfortable, and stress-free environment. We value openness in communication and thus seek to communicate with our patients in a manner that is clear, concise, and consistent. Our goal is to always seek to educate, remediate, and provide improved comfort and health. 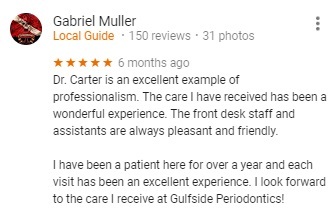 All of the members of the Gulfside Periodontics team are knowledgeable, competent, diligent, and conscientious and are committed to doing whatever it takes to help you with your oral surgery, periodontal disease treatment, dental implant, or cosmetic periodontal enhancement needs. The principles that underlie our business today are the same ones on which its foundation rests: communication, integrity, teamwork, consistency, and commitment. We believe these core principles are good for our business, good for our employees, and good for our clients. There is no need for you to fear your visit to Gulfside Periodontics. We promise your visit will be pain-free with our caring dental and periodontal specialists. You can expect that your diagnostic examination will take approximately an hour and a half. We will first take a thorough medical history and review your dental records. 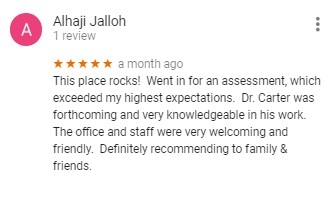 Then, Dr. Carter will examine your mouth, teeth, and gums for problems or concerns such as bleeding, swelling, signs of infection, loose and missing teeth, receding gums, and other criteria. He will examine your bite, measure to determine bone loss, make a note of any damaged or lost teeth, and when his examination concludes, will consult with you to ensure you understand your diagnosis as well as your relevant treatment options. You are encouraged to voice any questions you may have. X-rays are possible at this visit. What Should You Bring to Bring to Your Appointment? If unable to complete the required medical forms ahead of time, we ask that you please come a few minutes early so that you’ll have time before your appointment to complete them in the office. A periodontal dentist, also known as a periodontist, is a dentist who specializes in the dental specialty of periodontal disease, or periodontology. Periodontal disease is a broad term that describes a broad range of inflammatory mouth and gum disorders. Late stage periodontal disease threatens the teeth, gums, and potentially the bone of the jaw. Some people are believed to have a genetic susceptibility to periodontal disease. Early stage irritation and inflammation lead to gingivitis that, unchecked, is apt to morph into other manifestations of infection such as those labeled as aggressive, chronic, and necrotizing, in turn, each a primary and undesirable progression of the disease’s reach. A periodontist is someone who, in addition to all the other years of schooling that it took to become a regular dentist, also took on the rigorous study of the diagnosis and treatment of oral inflammatory diseases affecting the mouth, gums, and underlying structures. Periodontists perform surgical as well as non-surgical procedures designed to restore and maintain your oral health. For example, periodontists are trained to perform specialty procedures such as dental implants and sedation. They are uniquely qualified to assess your periodontal health and to help you devise a suitable treatment plan. Watch what our patient has to say about a full mouth gum surgery! Your oral health ultimately influences your health in many different ways. Your mental health, mental health, social health, physical health, and even emotional health all depend on you having healthy teeth and gums. Our office location is easy for patients to travel to, situated easily in Ocean Springs, MS. Call and make your appointment with Gulfside Periodontics today at 228-875-1881. It’s the first and next step in the right direction. Are Bleeding Gums Serious? What is Periodontitis? Healthy gums support stable teeth and strong bites. Gums that bleed as a result of inflammation are indicative of a serious condition known as periodontitis. Periodontitis is a specific infection of the gums. Unchecked, periodontitis leads to lost teeth as the infection attacks not only the gums, but their underlying support structures, too. Sometimes the bone of the jaw itself is threatened. Periodontitis is serious because it potentially threatens far more than just one’s teeth. If the bacteria that fuels periodontitis leaks into your bloodstream as often happens, it gains the ability to free-travel throughout your body, and is apt to attack anywhere. Your heart, circulatory system, and digestive tract may be particularly vulnerable. Your oral health is important, not just to your appearance, but your health in general. Without treatment, periodontitis can help pave the way for several life-threatening diseases such as heart disease, diabetes, and bacterial attacks on the heart itself. Most people see their dentist once or twice a year for a checkup and professional cleaning (prophylaxis). Regular dental checkups are a proven means of preventing dental problems as well as catching them early. As important as these visits are to the average person, they are even more imperative for those actively engaged in battling periodontal disease. Many professionals recommend patients be seen quarterly to maintain their forward progress. Dental prophylaxis removes the plaque beneath the line of your gums before it starts to erode their attachment to your teeth. Depending upon individual need, it may be that you will need other of our services such as tooth scaling, root planing, and you may wish to take advantage of the opportunity to have a regular oral cancer screening. Dental prophylaxis removes plaque from beneath your gum line before it can damage the gum’s attachment to the teeth. Other services are available according to individual need and include such procedures such as tooth scaling, root planing, and oral cancer screening. Pocket reduction surgery refers to those procedures designed to reduce or eliminate the pocketing that occurs when your gums separate from your teeth, creating “pockets” in which bacteria thrive and multiply causing tissue damage as well as the loss of both bones and teeth. Hard tissue refers to bone, which can is restorable through a process called guided tissue regeneration. The biggest concern people have when considering dental implants is surprisingly not the cost of dental implants but whether they’ll be good candidates for this treatment. Bone regeneration ensures that there is an adequate amount of stable bone to secure the implant. Healthy gingiva, or gums, are supposed to adhere firmly to the teeth they support, protecting sensitive roots. Gums that adhere too much and come too far down on your teeth may make your smile appear as much gum as teeth. They protect the roots of your teeth from trauma, changes in temperature, and bacteria. Trouble starts when your gingiva starts to recede. Gum recession frequently leads to even worse problems. A gingival graft transfers small amounts of gingival tissue from other areas of the oral cavity and grafts it to restore missing gum tissue. The exposed root is protected and gives that tissue time to regenerate on its own, protecting the exposed root. Many people are fearful of experiencing pain in their mouths and for that reason, and perhaps because of painful childhood experiences, many people only visit the dentist when they have no other option. At Gulfside Periodontics, we know that there is no need for anyone to ever fear treatment at our practice. We believe that every patient has the right to comfortable treatment, and that includes freedom from anxiety regarding pain as well as what some call “dental chair phobias.” We offer more than one type of sedation dentistry including IV Sedation as well as Oral Sedation. Feel free to discuss any concerns you might have and to ask how much does sedation dentistry cost with any of our friendly associates. Working together, our team will help you find the option that suits you best, ensures your comfort, and leads to treatment success. Not all people are born with perfect bites, and many so blessed still are apt to end up needing to have their bite adjusted in one way or another to avoid further problems and complications later. TMJ, braces, stress-response habits affecting the teeth such as grinding and clenching, as well as other factors alter our bites in ways that cause our teeth to meet poorly. Don’t suffer needlessly as chances are there is a bite adjustment possible to make your bite feel comfortable once more. Dr. Carter can ease points of pressure between the biting surfaces of your teeth by subtly reshaping them or altering their position. Each person’s needs are unique and therefore requires an individualized treatment plan. At one point in time you might have had little choice but to choose between wearing dentures or sacrificing your appearance as well as your ability to chew and speak clearly. Today, there are additional choices, such as dental implants that go directly into your jaw and permit the attachment of artificial teeth that will function as normal teeth. Dental implant technology is changing rapidly, so be sure to ask Dr. Carter which options are best suited for you. Whether you need one tooth or a whole set, chances are there is an implant solution that will measurably improve the quality of your life. You’ll look and sound normal and be able to eat anything you desire, which is rarely the case with dentures. Furthermore, your facial features will continue to look as they always have and won’t deteriorate from lack of support. Healthy gums support healthy teeth which in turn support a healthy body. The number one reason for lost teeth in adults is gum disease. We can help you avoid being one of those statistics. Dr. Carter and his staff make it their mission each day to provide Ocean Springs area residents with the best periodontal care possible. They do this through up-to-date equipment as well as with regular training in cutting-edge assessment and diagnostic techniques, patient treatment, and more. We view you as our friends and neighbors, and like to treat you as such. 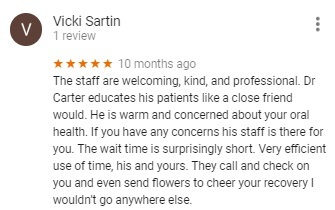 It is our pleasure to offer dental care you can rely upon, care that is delivered by a genuinely compassionate team in a supportive, compassionate, cheerful environment. Look no further than Gulfside Periodontics, located right here in Ocean Springs, MS, to find a periodontics practice that’s second to none. Learn more about our periodontists’ approach to care here, or learn more about what we do and why dental health is important on our blog.